The President’s Analyst on VHS video. Starring James Coburn, Godfrey Cambridge, Severn Darden. Directed by Theodore J. Flicker. 1967. With responsibility for world peace, national debt and dessert choices at state dinners, the President of the United States carries a heavy burden. With all that pressure, it seems like a good idea to find him an analyst. Someone to talk to. 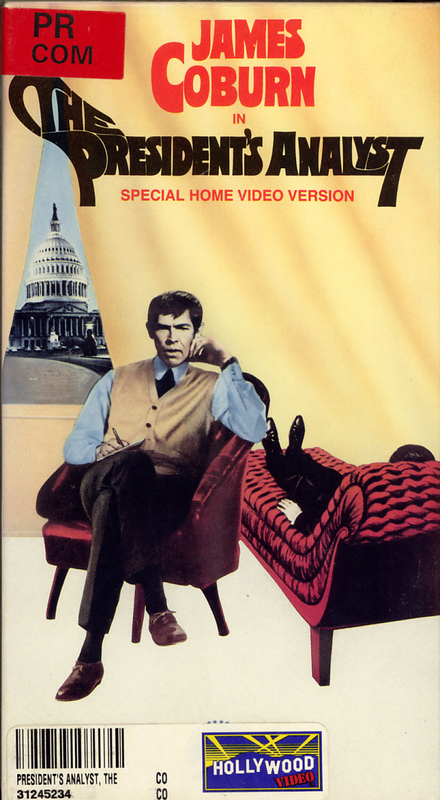 And Dr. Schaefer (James Coburn) gets the job. Unfortunately for the shrink, the more the President gets off his chest, the bigger the price on the good doctor’s head. Hostile governments want Coburn captured so they can learn what secrets are confessed in the Oval Office. Friendly governments was him killed. What follows is a succession of comic near-misses. Some music has been changed for the home video version of this title. Maverick on VHS. Starring Mel Gibson, Jodie Foster, James Garner. With Graham Greene, Alfred Molina, James Coburn, Danny Glover, Margot Kidder, John Fogerty, Reba McEntire, Waylon Jennings, Clint Black, Corey Feldman. Directed by Richard Donner. 1994. Ante up — for laughter and action aplenty! Mel Gibson is sly gambler Bret Maverick. Jodie Foster is a charming scam artist and James Garner (the original Bret Maverick, from the Emmy-winning TV series) is a laid-back lawman in Maverick, the crowd-pleasing hit that deals you a winning hand. 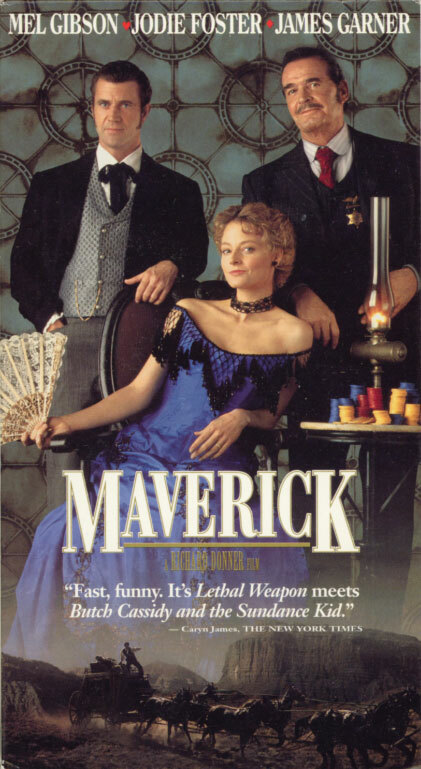 With more twists than a switchback trail and more sleights of hand than a shell game, Maverick is rollicking proof of how the West was fun. A riverboat poker tourney promises a winner-take-all $500,000… and Bret aims to be the winner who does the taking! But first he must cope with the hangman’s noose, a runaway stage, a wily Indian chief, outlaws, ingrates, a bagful of rattlesnakes and more close calls than a long-tailed cat in a roomful of rocking chairs. So don’t miss the excitement. The jokers — Gibson, Foster and Garner — are wild! 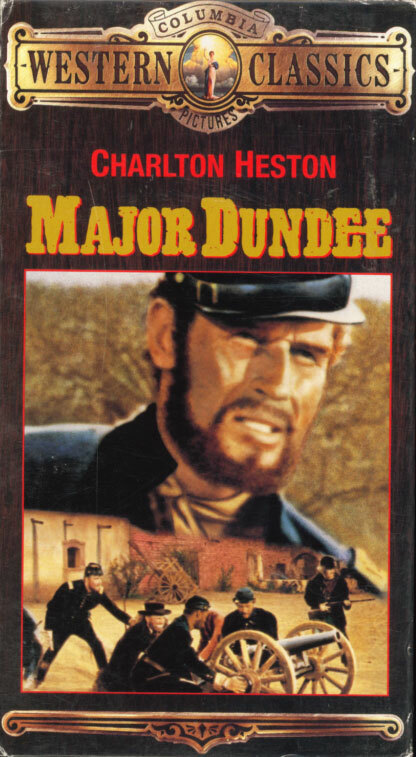 Major Dundee on VHS. Starring Charlton Heston, Richard Harris, Senta Berger. With Jim Hutton, James Coburn, Michael Anderson Jr., Slim Pickens. Directed by Sam Peckinpah. 1965. Charlton Heston and Richard Harris are unwilling allies in director Sam Peckinpah’s spectacular Western adventure. When Apaches massacre a U.S. cavalry troop in New Mexico, Major Dundee (Heston) assembles an army of cutthroats, renegades and Confederate prisoners led by his hated counterpart, Captain Tyreen (Harris). Dundee and his rebel band pursue the Indians into Mexico, where they battle the French army as well as murderous Apaches. Aiding a ravaged village, the men are honored with a fiesta, and the Major finds solace with beautiful Teresa Santiago (Senta Berger). But this idyll is only temporary. In an unforgettable climax, the two officers put aside their fierce rivalry and lead their troops to confront the French in a bloody showdown.